Control awesome hoops action when kid versions of NBA stars join the Backyard Kids! Pick your favorite pros and hit the court for some crazy b-ball excitement -- nail jump shots, pick off passes and throw down slam dunks like a superstar. 07-21-2017 shepard11 Box Text BACKYARD (NBA) BASKETBALL Swoop to the Hoop! Control awesome hoops action when kid versions of NBA stars join the Backyard Kids! Pick your favorite pros and hit the court for some crazy b-ball excitement -- nail jump shots, pick off passes and throw down slam dunks like a superstar. ALL 30 NBA TEAMS! This is a list of VGCollect users who have Backyard Basketball in their Collection. 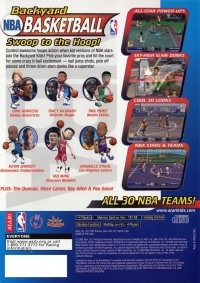 This is a list of VGCollect users who have Backyard Basketball in their Sell List. 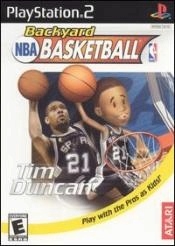 This is a list of VGCollect users who have Backyard Basketball in their Wish List.